The new REOTRON range of ‘phase-angle’ controllers, manufactured by REO, is designed for regulating current, voltage or power to resistive or resistive/inductive loads. 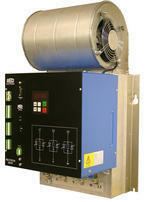 The largest controller in the new REOTRON range is rated current at 3 x 300A (shown in the picture). The smallest in the range is rated at 6A for single-phase supply. Options include a choice of fieldbus interfaces, including Interbus-S, Profibus-DP and CAN-Bus. Operating parameters can be set up manually over the field-bus interface or locally through a user-friendly touch-panel and digital display which is incorporated in the unit's front-panel. It is also possible to connect potentiometers for set-point setting, as an alternative means of adjustment. These REOTRON controllers can operate in either a burst-fire or phase-angle mode depending on the application requirements. They are designed for panel-mounting and can be used in many different processes including those which involve drying, heating and sterilising, for example.